Earlier today, I posted this picture demonstrating the luxurious life of the grad student. Friday night? Studying. Saturday morning? Scrawling note cards. Saturday afternoon? Feverishly typing a take home exam. Saturday night? Grading. 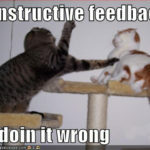 Oh, the grading. It’s usually my least favorite thing on the planet but tonight, I was pleasantly surprised. This semester, I am teaching a class I made up called Relational Leadership in the 21st Century. 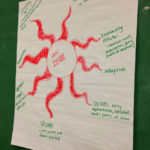 Yes, I know, cheeseball title, but the crux is getting at interpersonal processes in leadership and teaching students how to be relational, ethical leaders. And did you get the part where I made it up? Constructed or developed might be better terms, but the gist is the same. I picked the textbook/readings, designed the assignments, and have been winging it since September. My favorite parts? Reading reflections to the random assignments students are given like this week’s spirituality exercise. Yes, read that sentence again, I said spirituality exercise. The Blue Muse is a post-thesis enterprise, but for those of you who have not known me prior to last August, I spent my master’s program and the first part of my doctoral studies investigating spirituality at work. I find it entirely fascinating and I thought what better place to chat about it than in a leadership class. (Captive audience, you know?) Of course, I am not proselytizing or preaching religion, but merely asking students to consider all of the possible facets of leadership, like spirituality, kindness, humility, transformation, etc. So in addition to reading a couple scholarly articles (which they hated, by the way. Apparently 20 pages is too much for the undergrad brains), I asked the students to choose a short spiritual practice, reflect upon it and think about how leaders could incorporate spiritual practices at work. To give you examples of spiritual practices, I suggested anything from meditation, prayer, journaling and yoga to fasting, volunteering, hiking or watching the sunrise. Basically chances for them to stop for a few minutes, get centered, think about their lives, and reflect. The brief paragraphs I read were fascinating! Students talked about fishing, hiking, yoga, volunteering, meditating, listening to classical music, walking, helping others, donating money, and how those practices helped them put their lives into perspective. I really loved getting a glimpse at students pushing their own boundaries, reflecting candidly and thinking about the world a bit differently for a spell. 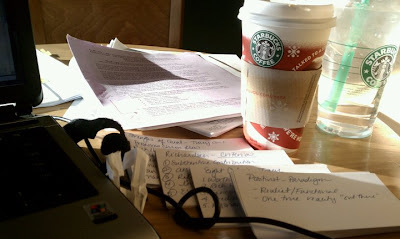 2 Responses to "Reading about spiritual practices: Sometimes grading can be fun"
I think it is awesome that the picture for the spiritual practice blog has two Starbucks cups in it. There is something there about Starbucks being a place for spiritual centering…yes? It should come as no surprise that I consider Starbucks a house of worship. SOME day I'll go back to going there socially.